Defensively, you can use this to increase your storm count or make more Moar Biggar Monk Tokens like people used good ol' Arcane Denial. You can use it to rebuy and recast your Flusterstorm for BIGGER. You can save your own spells from being countered so you can cast them next turn. Card is really cool, and I think it's absolutely playable. The trick is whether a deck really wants this particular toolbox of effects. Now, why can't Wizards give us this level of toolbox awesomeness in cards that are not blue counterspells...? 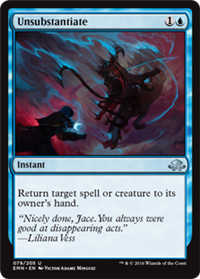 EDIT: In addition to the above, this card has fun uses in Legacy. It punishes Miracles really hard, since it can counter a spell being cast as a Miracle and stuff it into their hand. It kills Angel tokens in a pinch, too. Against Abrupt Decay and Supreme Verdict, it at least delays the spell for a turn most of the time -- it's not actually countering the spell. I don't know... how much are decks really hurting for a Tinker target answer these days? Remand sees no Vintage play and drawing a card makes the spell much, much better. Against many creatures in Vintage, Unsubstantiate is not great... you're probably not champing at the bit to allow your opponent to re-cast Thought-Knot Seer. Bouncing Mentor or Pyromancer can buy you a bit of time but does not address the token army. as a general rule these days, don't bother reading non-rares. They aren't intended for constructed play. I think this card is exceptionally great in almost all formats. And with more and more cards being uncounterable, it will become a staple overtime. Something that can't get overlooked is the "return a spell" part of the card versus "counter a spell." This gets around Cavern of souls (for a turn) and does hit Abrupt Decay and Supreme Verdict. Not this these cards are played much, but they do see Vintage play. @gkraigher That's true, this will delay Abrupt Decay. I'm still still skeptical that this is anything more than very marginal utility, unless BUG and Tinker decks start dominating the metagame. Well, you never are shy with your opinion, are ya? This spell does something no other spell does at a Vintage-playable cost. It's removal in a pinch, it's a way to interact with un-counterable spells, and it's a broad but somewhat weak counterspell in other applications. That kind of flexibility is rare and this is a good card. Now, it only gets played if there is a deck or metagame that wants those kind of effects. Sort of like Swan Song; it absolutely has applications. EDIT: Also, cue up the usual, "Jace is a four mana brainstorm" argument as an example of how flexibility can be really important. We only get a few slots in our blue decks after all of the Reserved List spells are put in there, so we need all the flexibility we can get! This card is great imo. True it don't draw like remand but the virtual card advantage you can get off bouncing a FoW or Misdirection or Gush after they pitched a card, or bounced 2 islands or returning that abrupt decay targeting your oath or mentor can be absolutely back breaking. Also at 1U it's cast able off a mox and one land, at the worst it can act as a pseudo time walk. And that's just bouncing spells. I know I'm getting a play set asap. @Serracollector I'm totally with you on how cool this card is, but I will channel wappla a bit and point out that the applications you reference are all ALSO obtained from Remand, plus you get to draw a card. I think that was his point. What sets this card apart, in my eyes, is that it's not useless against stuff on the board or uncounterable spells. The question I have is venser is already not Vintage caliber. Does cutting the cost but then cutting a lot of the versatility from him make this card worthy? As I said in the facebook thread on this - I would rather either swords the creature after it enters play (assuming cast thru caverns) or just counter the spell on the stack. Yes, I realize this takes those 2 effects and combines them into 1 card. But in both cases its only a half-measure. Half-measures do not cut it in Vintage. @wappla Have you seen the thread about the sorcery speed AK? I would reserve your disappointment for more worthy targets. You can target your own spell to free it from being countered by your opponent. Also good on Storm cards such as Flusterstorm. Or you could just counter your opponents counter and resolve your spell. . .
@Khahan It's not s'much better at winning the counter war, but it does let you recover the spell to cast later if instant-speed stuff has changed the situation. Like, you can snag back your bolt if they removed their creature in response, I dunno. I don't think that's a good argument for this card anyway because it falls into the "What about Remand" trap. It's combining a level of removal and a level of countermagic with the Remand-style tricks that makes it interesting. You're being overly hyperbolic. A card is discussed to flesh out its merits for vintage decks. If we don't debate a card's merits, then we'll always be blinded by our own myopic view of a card. People are offering plenty of discourse with which you can expand your own myopic view, but you're being stubborn. In any case, I think the card provides enough versatility to at least warrant playtesting in some decks. The card is blue, and the toolkit for blue is already huge, but this card provides a slightly different angle of attack; it can be proactive or reactive. I'm not going to complain at all about any card being discussed. Damn, I was even ready to talk about "Lone rider", a vintage unplayable card that "easily" can transform into a decent 4/4, for just 1W. Unsubstantiate is versatile, but both options are underpair. It could see some play, and it's a good tempo card, but outside tempo, it's card disadvantage. If versatility was really important, people would play charms. Izzet charm has 3 useful options, same as rakdos charm, dimir charm or other charms. Any of them has seen enough play after initial months. I tried Rise // Fall with no luck, and outside wear//tear I cannot remember any split or fuse cards that have seen regular play. Jace is a house not because versatility (which is great), but because it's not a 4cc brainstorm, it's a 4cc brainstorm for every other turn unless the opponent does something, or continuous top manipulation, or even 3 bouncers in one card. But the main point is repeatable brainstorm. Versatility is good, but it has to be an extra, no the main point. If this card said "put spell into owner hand, creature into owner hand, or card from a graveyard into owner hand" then it would have been awesome, since regrowth is good itself. As it is now, it has two cute (and often handy) effects, but apart from the tempo boost, it seems below vintage quality.